Abdi, S., Ebrahimzadeh, I. (2018). The Effect of Welding Parameters on the Room and High Temperature Tribological Behavior of the Weld Overlaid Die. International Journal of Iron & Steel Society of Iran, 15(1), 19-27. S. Abdi; I. Ebrahimzadeh. "The Effect of Welding Parameters on the Room and High Temperature Tribological Behavior of the Weld Overlaid Die". International Journal of Iron & Steel Society of Iran, 15, 1, 2018, 19-27. Abdi, S., Ebrahimzadeh, I. (2018). 'The Effect of Welding Parameters on the Room and High Temperature Tribological Behavior of the Weld Overlaid Die', International Journal of Iron & Steel Society of Iran, 15(1), pp. 19-27. Abdi, S., Ebrahimzadeh, I. The Effect of Welding Parameters on the Room and High Temperature Tribological Behavior of the Weld Overlaid Die. 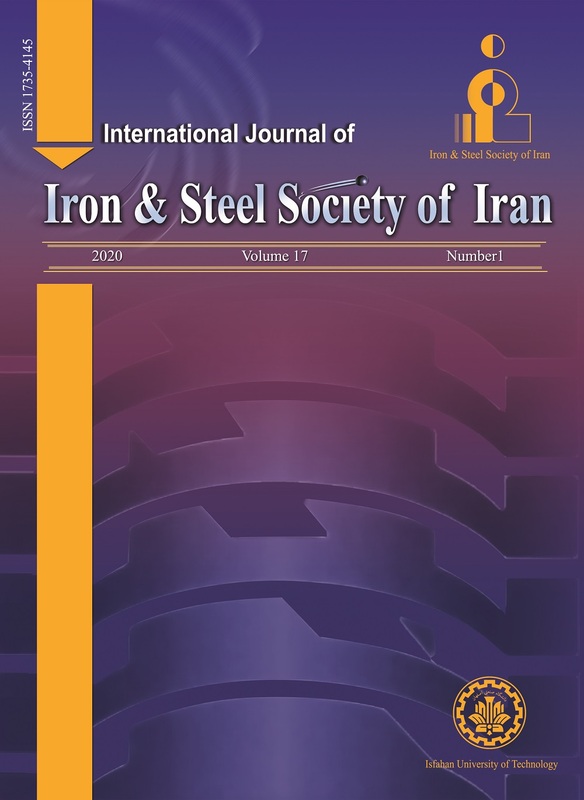 International Journal of Iron & Steel Society of Iran, 2018; 15(1): 19-27. As an important problem in forging factories, dies are destroyed because of high wear rate, plastic deformation and thermal and mechanical fatigue at high temperatures. This paper is an investigation into the use of nickel super alloy with different welding parameters. Three weld overlaid alloys of inconel625, as wear resistance hardfacing materials on H13 tool steel, with different welding parameters were deposited on H13 steel substrates using the tungsten inert gas welding process. Dilution, microstructures and microhardness of the weld overlays were obtained at room temperature. Wear tests were carried out using the pin-on-disk wear tester at room temperature and 550 °C. The wear surfaces were examined by scanning electron microscopy (SEM). The results showed a much lower wear at high temperature with the weld overlays welded under the pulse condition. In the performance tests, a better die life behavior was observed by using a die coated with Inconel625. The die life in the hot forging of production was increased by 86%, as compared to AISI H13 steel. D. H. Ko, B. H. Kang, D. C. Ko, B. M. Kim: J. Mech. Sci. Tech., 27(2013), 153. H. Kashani, A. Amadeh, M. R. Vatanara: Mater. Sci. Technol., 24(2008), 356. L. Cser, M. Geiger, K. Lange, J. A. S. Kals: J. Eng. Manuf., 207(1993), 223. M.Terèelj, P. Panjan, P. Fajfar, R. Turk: Surf. Coat. Technol., 200(2006), 3594. M. Farhani, A. Amadeh, H. Kashani, A. Saeed-Akbari: Mater. Sci. Forum., 30(2006), 212. G. P. Dinda, A. K. Dasgupta, J. Mazumder: Mat. Sci. Eng., 509(2009), 98. K. Lange, L. Cser, M. Geiger, J. A. S. Kals: Annals of CIRP-Manuf. Technol., 41(1992), 667. I. Ebrahimzadeh, F. Ashrafizadeh: Ceramics International, Vol. 40, Issue 10, Part B., (2014), 16429. I. Ebrahimzadeh, F. Ashrafizadeh, J. Mater. Eng. Perform., 24(2015), 529. I. Ebrahimzadeh, F. Ashrafizadeh, Int. J. Adv. Manuf. Tech., 77(2015), 609. D-G. Ahn: Inter. J. Precision Eng. Manuf., 14(2013), 1271. H. Kashani, A. Amadeh, H. M. Ghasemi: Wear, 262(2007), 800. K. Weman: Welding Processes Handbook, CRC Press LLC, New York, 2003. B. Cary, S. C. Helzer, Modern Welding Technology, Pearson Education, Upper Saddle River, New Jersey, 2005. A. S. C. M. D’Oliveira, R. S. C. Paredes, R. L. C. Santos: J. Mater. Process. Technol., 171(2006), 167. F. Madadi, F. Ashrafizadeh, M. Shamanian: J. Alloys Compd., 510(2012), 71. J. Cornu: Advanced Welding System, TIG and Related Processes, Vol. 3, Springer, Heidelberg, (1988), 61. A. S. C. M. D’Oliveira, R. Vilar, C. G. Feder, Appl. Surf. Sci., 201(2002), 154. J. Jiang, F .H. Stott, M. M. Stack: Wear., 256(2004), 973. S. J. Kim, J. K. Kim: J. Nucl. Mater. 288(2001), 163. B. AlMangour, D. Grzesi, k-M. Yangb, J. Mater. Process. Technol., 244(2017), 344.